At the time when I bought it the fake Orenz wasn’t much cheaper than the real thing. I bought mine in November 2017 for £2.23 (~ $3.16; €2.55), but now you can get them for much less (£1.32 or $1.50 with free postage ). Have a closer look at this pencil in my video. The click-baity title and cover picture are thanks to some ‘advice’ from Techmoan. To me, this is not a surprise anymore. Even though I did not expect at first to see fake pencils, the world is full of them. It’s like with everything else. i wrote a post about a few fake pencils that I saw (see link). 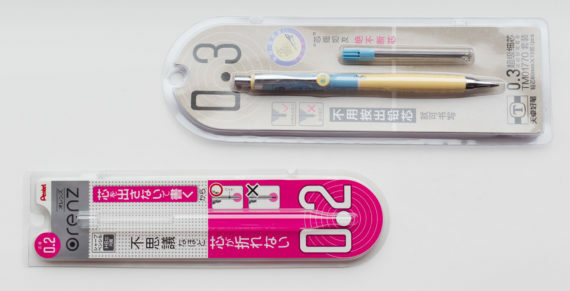 For me the biggest surprise in this category is the Daco pencil which imitates the Rotring Tikky. I still wonder who buys them when you can get the Rotring for such a low price, and you get such a good value pencil. I somehow knew and forgot or never knew that PapernDigital is your blog. Well, I am sure I will remember from now on. Just recently I revisited your blog and had a look again at some of the great blog posts you wrote! I agree, regarding the Tikky. One thing to mention is that the Tikky nearly doubled in price on the high-street here in the UK in recent years, which might make fakes more tempting, but saying this: I never saw a fake in the UK. I remember you had a post about a store with writing instruments and I remember the price of the Tikky was very high. I can purchase the Tikky at around 2.5 Euro. So paying 1.2-1.4 Euro for a copy doesn’t sound a great deal. On the other hand it is as shame that rotring is pushing prices up while the quality is going a bit down. I feel that previous versions of the Tikky were better made.vious versions. Rares, 2.50 Euros seems a great price these days. I know what you mean (price and quality). Saying that, I am happy that the Chinese Tikky has a brass clamp, like the German Tikky II. Boško, fixed sleeve and plastic mechanism? That seems like a bad step back. Thank you for the link.